Join me online and learn how to dye cotton in a controlled manner – creating luscious, complex colors with lots of visual texture. This class will teach you how to use fiber reactive dyes to color cotton using low water immersion (LWI) methods. Dyeing fabric using LWI gives you an uneven flow of color that provides incredible visual texture. I crave colors with complexity, those that are made from all 3 primary colors, they have subtle nuances in hue that make people want to invent new color names. 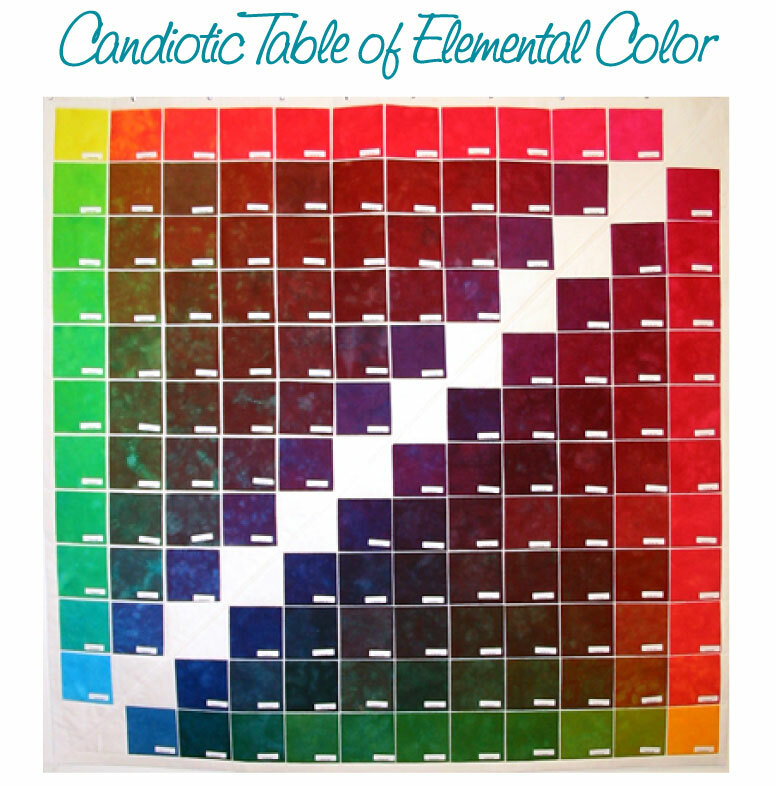 This led me to the creation of my “Candiotic Table of Elemental Color”. It is 66 different ways to combine 3 different primary colors…twice, done in 2 different sets of primary colors. Because I was very interested in how each color would look when dyed by LWI, the swatches are dyed in this manner as well. 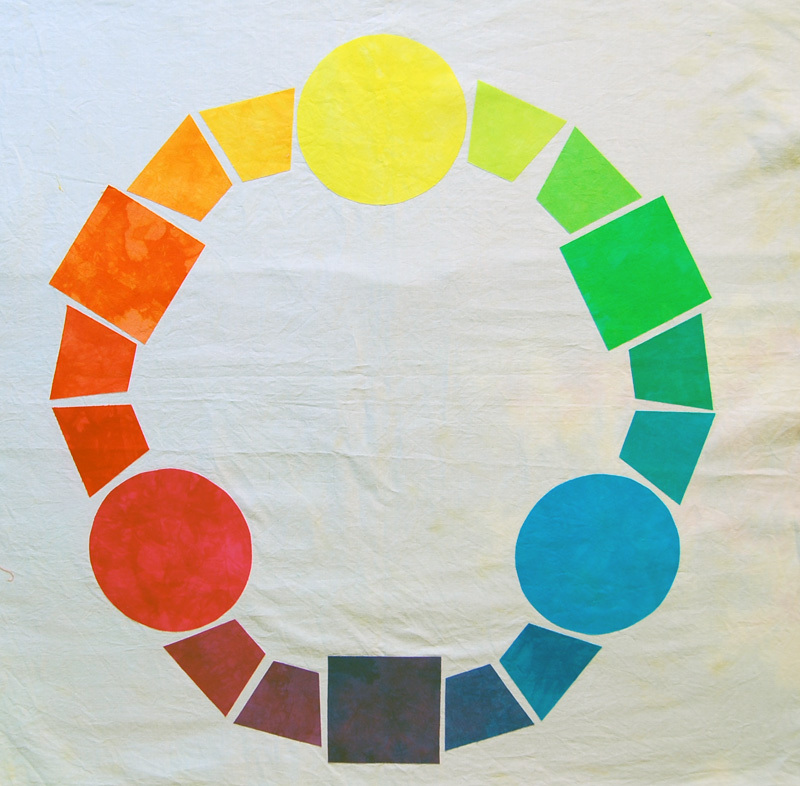 After creating this awesome reference palette, you will learn how to use it to dye larger pieces of your favorite hues. You will then create traditional color wheels of each set of primaries, training your eyes to choose the correct hues to evenly transition from one primary to another. Finally, you will learn how to make shades, tints, and tones of these hues. It is my intention to show you how I do these things, and then guide you towards creating your own palettes and develop your ability to reproducibly dye a hue in greater quantities next week, and a year from now. I have read and heard multiple times that “the best pieces of fabric are the ones where I just dump the leftover amounts of dyestock”. I heartily disagree! Take control of your color and make those beautiful fabrics intentionally! This self-paced online course is designed to teach you how to use Procion MX Fiber Reactive Dyes on cotton in a controlled manner. Whether you are a beginner, or someone who has dyed in this manner before, my intention is to help you gain confidence in color mixing on cloth and raise you from apprentice to “journey(wo)man” status. I will lead you through creating a series of color palettes and then teach you how to use those to reproducibly dye small or large amounts of particular hue. You will prepare (66) 5″ x 5″ swatches and dye vessels, mix your dye stocks of your first set of 3 primary colors and dye your swatches. You will prepare (66) 5″ x 5″ swatches and dye vessels, mix your dye stocks of your second set of 3 primary colors and dye your swatches. You could postpone creating this second triad until you’ve covered the rest of the lessons. There is plenty of color to choose from using only 3 primary colors. You will make the 60″ square palette with permanent labels shown above. After your “Candiotic Table…” is complete, you need to start using it! This session covers how to make more of any one of these hues, whether it’s 1/4 yard or 10 yards. You will create a color wheel for each set of primary dyes. The content of the site includes over 5 hours of videos, 90 pages of .PDF files (all the content except for the videos that you can download and save on your computer) plus 2 multi-page spreadsheets to use in calculating dye amounts and a worksheet for each session. Each session will have a Question and Answer forum associated with it – I will respond to any question you have within 24 hours, and both these questions and answers will be available for other registered students to view. The beauty of an online course is that if several people are having the some difficulty with a particular step, I will just create additional content to add to the session to clarify any confusion. 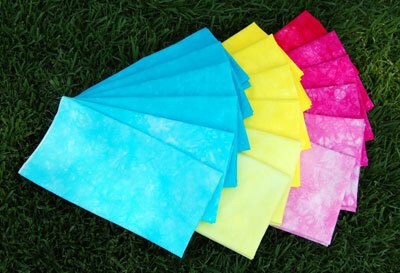 You would like to have a better understanding of how to create a certain hue on cotton fabric. You are tired of dyeing lackluster colors, or dyeing yards and yards of fabric in search of that ONE hue you just have to have. The idea of measuring things gives you hives. You’re not sure if an online class format will work for you; everything you paid for is immediately available to you, there’s no way to issue refunds if you find this format isn’t for you. Make sure to look at the at this checklist and my sample online class session before committing to this class. Also, I have a much smaller, simpler online class as an introduction to hand dyed fabrics you may want to look into. By day, I teach biology to students at the University of Redlands who are non-science majors. I am very comfortable engaging my students and putting complex ideas into terms they understand. I’ve spent 15 years learning how to dye fabric, and developed this way of dyeing to accommodate my busy schedule and not waste my limited resources. I have 9 “how to” articles published in various Interweave publications (see list here), I have been a guest on four episodes of Quilting Arts TV, and I created a workshop DVD for Quilting Arts last August. A video clip from that can be found here, and is a great introduction to my teaching style.